Dr. Ponsold Pharma, with its headquarter in Herdecke, Germany, is a pioneer in veterinary probiotic pharmaceuticals and specialised in the prophylaxis of diarrhea in calves. 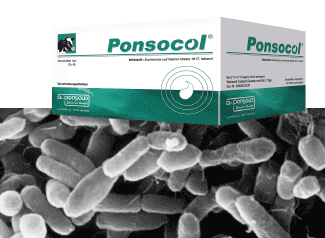 The active ingredient in the product Ponsocol is E. coli strain Nissle 1917. Ponsocol has occasionally shown further positive health effects on animal welfare, health in livestock, in pets and certain zoo animals. Ponsocol helps calves to better resist post-calving diarrhea during the first weeks of life, to fight off intestinal pathogens and to enhance productivity in cattle, to accelerate the establishment of intestinal microflora involved in the digestion of feed and last but not least to promote gut health. Ponsocol effectively antagonises the spread of intestinal pathogens typically involved in the pathogenesis of diarrhea in calves (similar to EHEC). Thus, Ponsocol helps to reduce the use of antibiotics and vaccinations and protects the health of the herd. Ponsocol promotes the protection of respiratory diseases, e.g. pneumonia. The tolerability of Ponsocol is excellent: no contraindications or adverse drug reactions are known. Ponsocol promotes faster improvement in growth performance and saves on co-medication costs. – Colostrum quality is impacted e.g. stage of lactation, poor pre-calving vaccination programmes or colostrum handling and cleanliness. – Calves from heifers run a greater risk of not getting enough colostrum in the first 24 hours.